1Type this URL into your browser address line: www.facebook.com. 2In the signup form that appears, enter your name, e-mail address, a password, your birthdate, gender, and then click Sign Up. 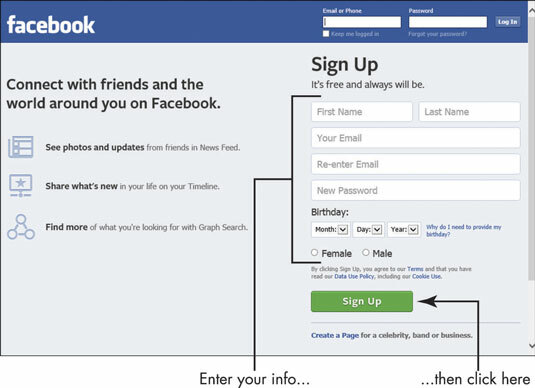 Note that the site requires your birthdate so that Facebook can provide certain safeguards for accounts of younger children, but you can choose to hide this information from others later if you don’t want it displayed. 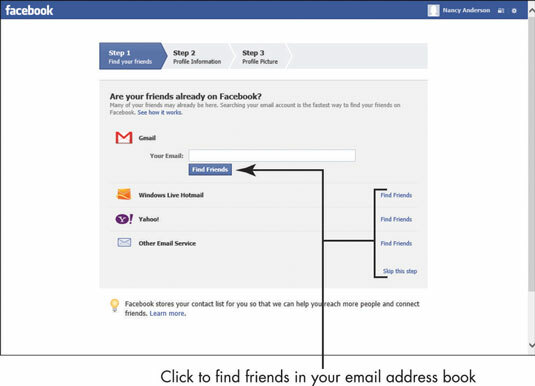 3On the screen that appears, you can click Find Friends to have Facebook search for contacts in your e-mail account address book and invite them to be your friends, or click Skip This Step to continue creating your account. In this case, click Skip This Step. 4In the next screen, enter profile information that you can choose to have visible to others or not. Details you can enter here include your schools, employers, current city of residence, and hometown. 6On the next screen, click Upload a Photo or Take a Photo if you’d like a picture associated with your account. 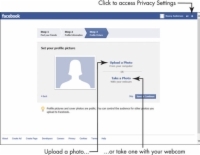 If you have a photo on your computer you’d like to use, click Upload a Photo and, in the form that appears, click the Browse button to display File Explorer. Locate the picture and then click Open. 7Click the Save & Continue button. Your account is now set up. 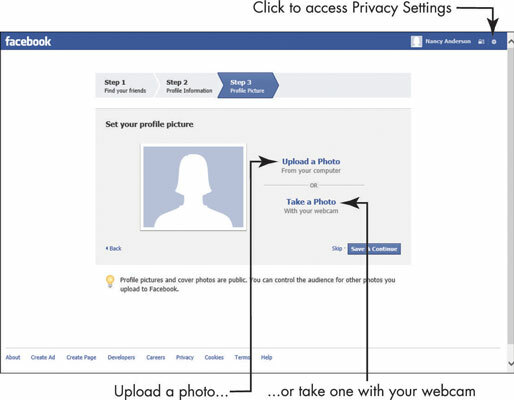 On the following screen, you can locate friends, check privacy settings, or find individuals you know who might have a Facebook account. Click the cog-shaped Options icon at the top right of your page at any time and then choose Privacy Settings to manage settings for who can access information you post on your page.